LAS VEGAS, Nevada - At InfoComm 2012, HARMAN Professional today introduced HiQnet Audio Architect(tm) configuration and control software, marking a new era in the HARMAN HiQnet platform. HiQnet Audio Architect represents the single-most comprehensive audio networking solution for professional fixed install applications providing integrators with a unified platform for system design, programming and custom control. HiQnet Audio Architect enables a greater level of integration for the end user by combining the functionality of predecessor software applications HiQnet System Architect(tm) and HiQnet London Architect(tm). The new software platform will provide system-focused configuration of over 100 HiQnet products from AKG, BSS, Crown, dbx, JBL and Lexicon. It merges the open-architecture DSP backbone of the BSS Audio Soundweb London family with the comprehensive workflow and customizable control of HiQnet System Architect. In adding the feature set of HiQnet London Architect to the HiQnet System Architect software platform to create HiQnet Audio Architect, the HiQnet team has included numerous user experience and workflow enhancements in order to provide the operator with as much depth and complexity as each system requires. It cleverly hides advanced features from a more novice user but does not inhibit the design of a large-scale system. The workflow paradigm introduced in System Architect 2 and more recently adopted by JBL Performance Manager(tm) carefully guides the designer from start to finish, and presents a cleaner workspace by displaying only the tools appropriate for each and every stage of the design. 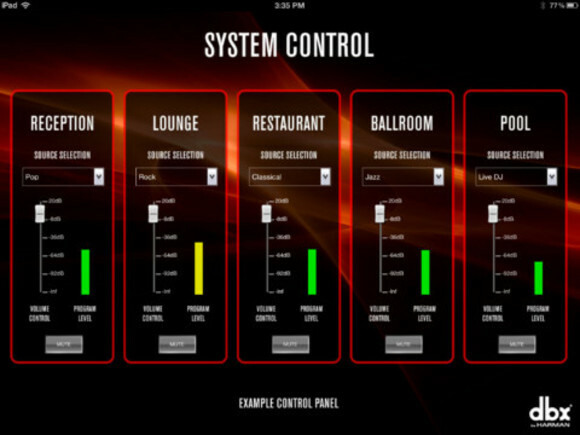 Being launched alongside HiQnet Audio Architect will be HiQnet Motion Control(tm) - an Apple iOS app which enables customized control interfaces designed in Audio Architect to be imported on iPad, iPhone and iPod Touch devices for mobile system control. Dedicated design templates are available within Audio Architect for the configuration of customized interfaces, which can be used to control devices from BSS, Crown, dbx and JBL. HiQnet Motion Control will be available from the Apple App Store imminently and will also function with HiQnet System Architect prior to the availability of HiQnet Audio Architect. HiQnet Audio Architect positions itself as the most versatile software application available today for the network configuration, by providing the ability to route the emerging AVB open standard, Cirrus Logic CobraNet and Audinate Dante audio network protocols, as well as HARMAN's proprietary BLU link high-channel, low latency digital audio bus, all within a single application. By providing the ability to route the three most widely-adopted audio network protocols within a single interface, a system designer educated in the use of HiQnet Audio Architect can flexibly move from one network platform to another without being experienced in multiple software packages. The BLU link digital audio bus offers a highly complementary solution to any network - whether AVB, CobraNet or Dante - by enabling far greater routing flexibility and the added benefit of alleviating bandwidth from the primary network. "With this introduction HARMAN emphatically delivers the best of both worlds, combining the feature-set of HiQnet System Architect and HiQnet London Architect Software. The introduction of HiQnet Audio Architect is a major milestone in the vision of the unified, end-to-end HiQnet networked audio system. We are now offering the all-in-one design, routing and control solution that the professional AV community has been waiting for. No other manufacturer can match the diversity of product offerings and the versatility of networked audio routing within a single software application as HARMAN will now provide through HiQnet Audio Architect - and this phase of the HiQnet program is really only just beginning," stated Adam Holladay, Market Manager, HARMAN System Development and Integration Group. Fresh off the back of the co-sponsored AVB Networking Conference 2012, for which public interest was overwhelming, HARMAN is also exhibiting on the AVnu Alliance booth, C11039, where its AVB-capable BSS Soundweb London devices will be taking part in the largest AVB interoperability demonstration to-date. HiQnet Audio Architect, the network topologies it configures and controls, and the accompanying HiQnet Motion Control iOS app will be demonstrated as part of an extensive HiQnet 'system wall' on the HARMAN booth, C10719.